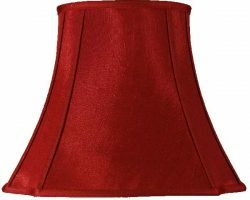 Here at Universal Lighting we are delighted that fabric lamp shades are back in fashion. 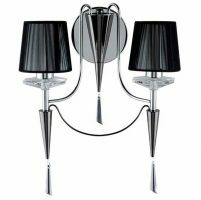 We have a wide range of designs to choose from whether you are looking for a grand affair for your standard lamp or a multitude of small shades to grace your many lighted chandelier. Soft fabric lamp shades are making a comeback! 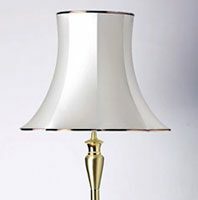 For a number of years now lamp, or light shades as they are also known, have been out of fashion, particularly for table and standard lamps and have been replaced with the hard backed versions. The main reason is that the hard lined versions simply travel better and the shades are less inclined to get damaged or grubby. Choosing the right size can be a daunting task and is the most important factor when it comes to buying a replacement shade for your existing lamp base. Generally there is no better way than seeing it in real life and if you can, nothing is better than taking your lamp into your local lighting stockists and trying on various sizes of shade on your base. Proportion is everything. Soft shades come in a variety of different sizes. Below is a list of the general sizes available. The table below should only be used as a guide only. Please be very aware that different shapes and designs can alter the overall look of your lamp. For instance, if the lamp shade includes tassels or fringe it will appear much longer. Choosing the right size of shade to suit your lamp is a very individual preference. Some people don’t like to see any part of the lamp holder, so they would choose either a shade with a fringe or of a larger shade, whereas others may prefer to see a small amount of the lamp stem. As already mentioned this is a general guide and as fabric lamp shades come in a range of different styles this also will add to the way it will look on your lamp, wall light or chandelier.There is a full article on our lighting information page entitled how to look after soft fabric shades that will provide you with information as to how you can keep them looking as good as new.